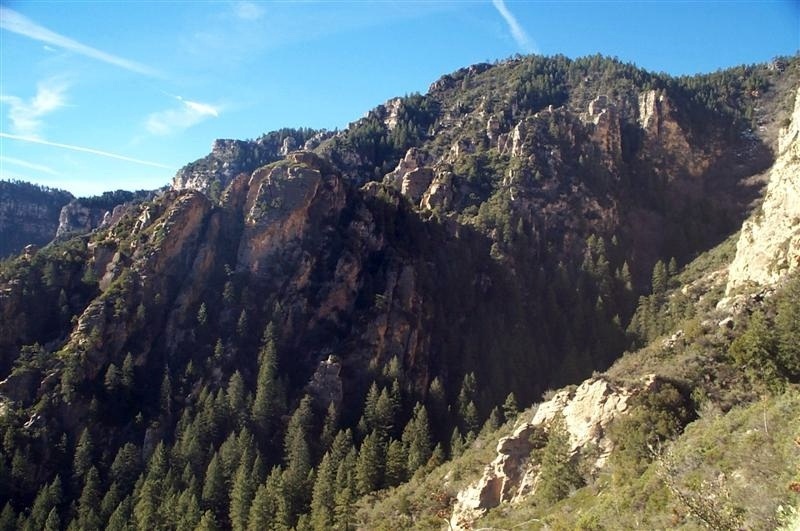 If you've ever explored Oak Creek Canyon near Sedona and imagined what it would be like to hike from the waters of Oak Creek to the top of the canyon, then imagine no more, because this is the route that will take you there! This hike begins at the Bootlegger picnic area, about 9 miles north of Sedona on 89A. The small picnic area is just past the Junipine Resort on the west (left side) of the highway. As far as parking is concerned, you're basically on your own to find a roadside pullout along this narrow, busy road. This may require driving beyond Bootlegger to find a space and walking south back to the picnic area. Make sure to exercise caution if using this option, as this area of the road is narrow, curvy and heavily traveled. Don't park at the resort or at the cabins north of the picnic area as they may tow your vehicle.... And make sure you get your Red Rock pass! Normally, the area swells with visitors during the recommended summer camping and hiking season, but our HAZ group got lucky during the off season on a record warm day in January and had the area almost completely to ourselves. Out of all the hikes in the area, you may be able to beat the crowds a bit on this trail since it takes some effort to get started. Once you are in the picnic area area, walk to the stairway at the southwest end which will lead you directly down to the creek for a fairly easy crossing. Scout the creek as you approach and look for the shortest rock hop route across the stream at the point of the small flowing rapids. After crossing the creek, look straight ahead for the power line pole and scale up the small ravine to the level area where you will find an unmarked trail. Take a right on this trail (heading north) and look for a second shorter pole where the power lines connect. Keep walking and at about 100 feet beyond that pole, you will see an elevator trail , (Going up anyone?)... 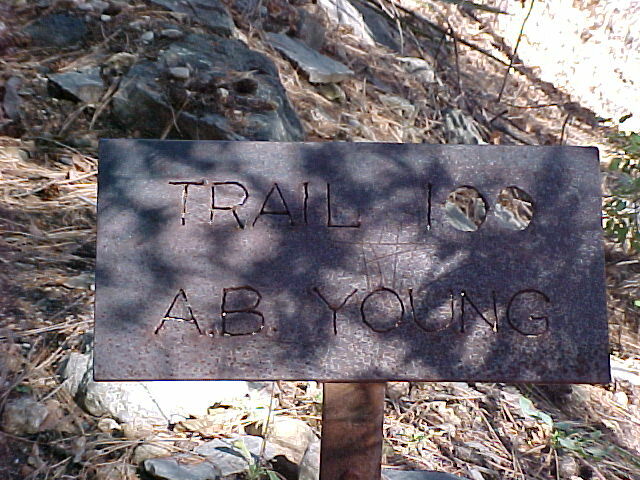 marked by a small rusty old sign that says "AB Young, Trail 100". History sources say that the Anasazi Indians used this trail as a return route to their summer hunting grounds and more recently, in modern times, was used to move cattle from the rim country until it was improved by the CCC in the 1930's. I'm not sure, but perhaps AB Young was a rancher in the area....This trail is also sometimes referred to as the East Pocket Knob Trail. Get ready for the vigorous one and a half hour stairmaster workout as this exciting trail, consisting of 32 switchbacks is going to take you from the trailhead at 5300 feet to the top entrance 1.6 miles ahead at approx 6700 feet! 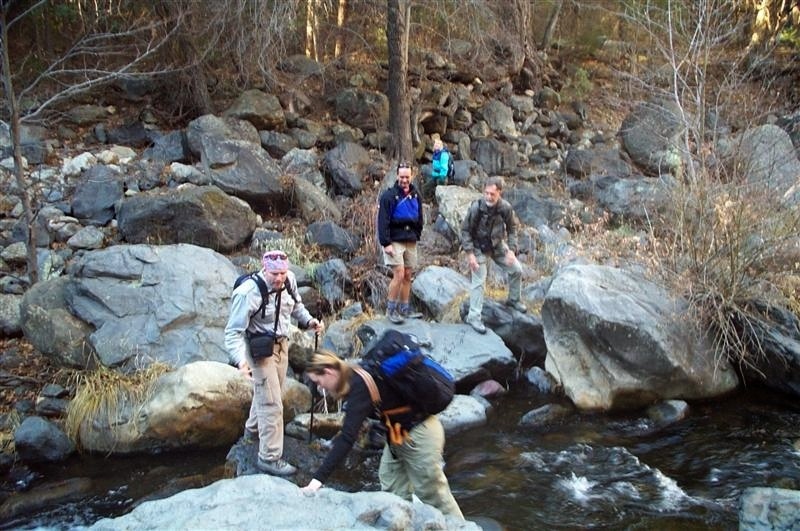 As you trek ahead and leave the lower shade of the trees of Oak Creek, the trail elevates quickly and opens up on the sunny slope, offering immediate views of the entire area of the canyon. The scenery is utterly fantastic and it just keeps getting better as you climb, so be sure to make a few stops to take it all in during the ascent. Gradually, the sound of traffic from the highway below gives way to peaceful winds and added solitude. 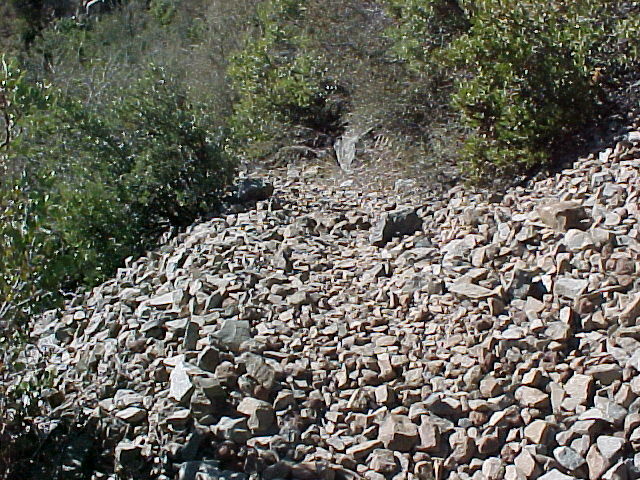 At near the halfway point of the hike to the top, the trail crosses a small rock slide bed. As you climb, you will continue to cross the rock slide bed 7 times as the trail switchbacks and elevates across it. The slide areas are short and not dangerous, but be aware of them and remain sure-footed as you cross them. The trail becomes a bit more narrow at about 6200 feet and you will encounter the personal space of the thicker bushes and vegetation that grow here, including century plant, agave and prickly pear, so it is probably best to wear long pants. After 27 switchbacks, you will encounter a long final ascent towards topping out on the main trail. It is easy to see your destination from this viewpoint, so hang tough for about 5 more switchbacks and you will get your reward. When you reach the top, you will be delighted to see a pine forest wonderland ahead of you as you stand on what seems to feel like the top of the world. If you choose to, you can continue from this point another 1.25 miles onto the East Pocket Lookout Tower at 7196 feet. 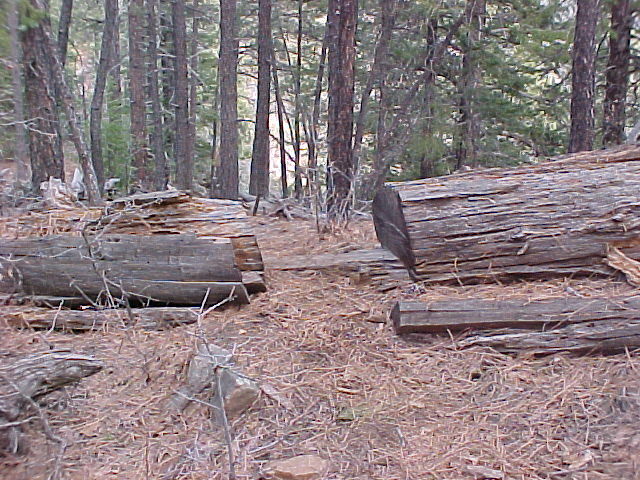 Follow the faint trail that leads off to the immediate left (southwest) by a large fallen log. 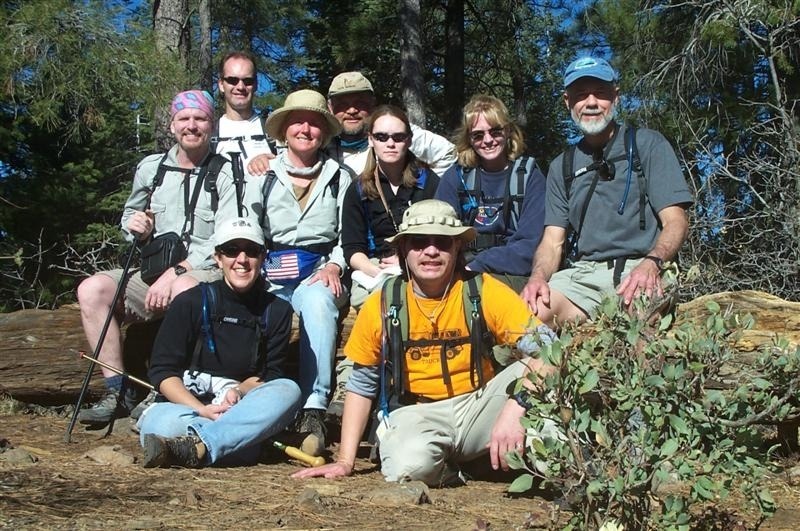 You will now be hiking on softer dirt and beds of pine needles under the shade of the ponderosas and junipers. This is an unmarked and unmaintained trail, but if you turn on your route finding skills it is not difficult. The trail pretty much follows the the eastern edge of the rim, so hang in that direction and you should stay on track with no problem. After about 15-20 minutes on this trail you will come across a small old wooden sign that says "Oak Creek" that marks the return route from the tower on your way back. There is a great lunch spot near the rim on some large rocks in the sunny opening to your left just beyond the sign. 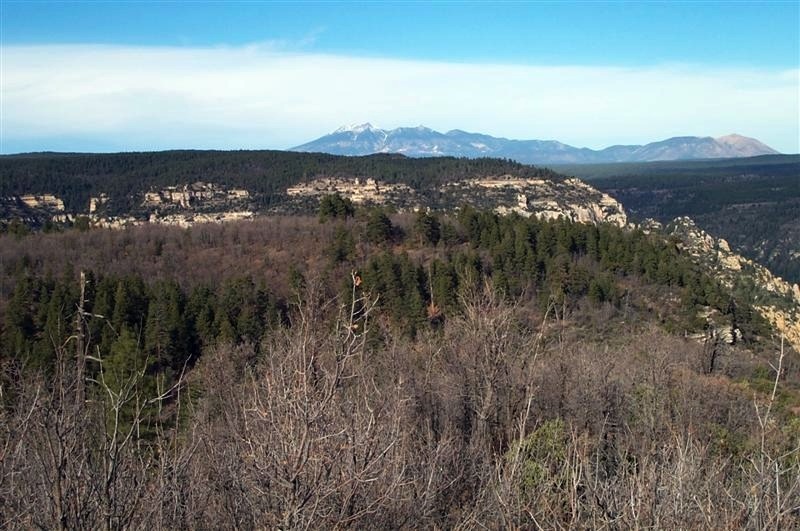 Here, there are excellent views of the Mogollon Rim, the Bradshaws, and the Mazatzal mountains in the far distance. Moving on, the Lookout Tower is only about 7 minutes ahead. The trail begins to go inland a bit, but you will see a couple of large rock piles and some small cairn markers that help guide you. Due to the season, the tower was closed on this trip, but it is possible to take the stairs up to the second level for a view to the south. There is an old Jeep road that leads off to the right and heads down in a westward direction from the tower that takes you to the "viewpoint" of the Secret Mountain Wilderness. The topo maps shows a northwest bound spur of the Jeep trail leading to a viewpoint which you encounter on your right shortly after you pass the gate at the bottom of the hill. We attempted the trek, but due to the slow trudging incline in the snow on the road, and the lack of daylight hours due to the season, we came up short this time. What a great reason for a return trip! 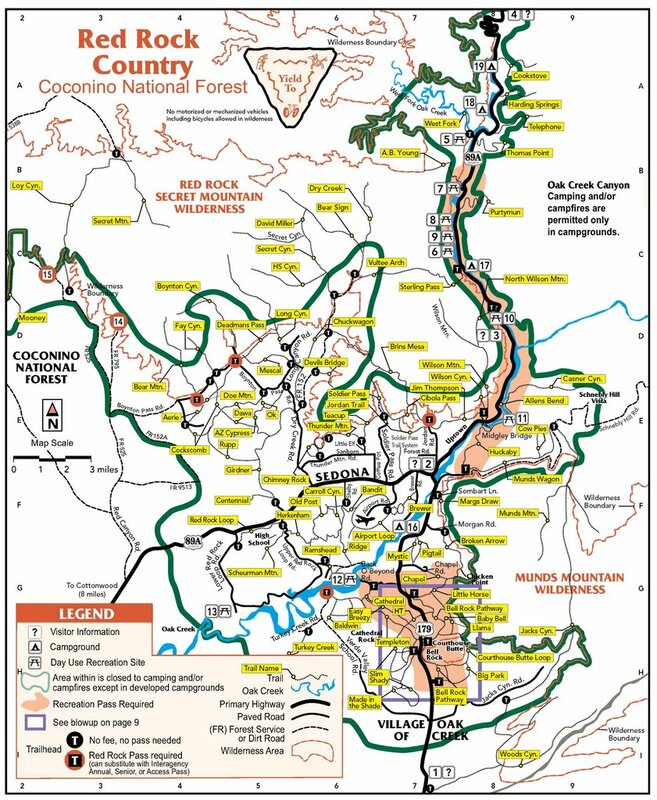 Take your topo map if you are planning to make it out to the viewpoint and give yourself plenty of time to explore this beautiful wilderness area. Since this is an out and back trip, return via the same route, passing the tower , through the pines and back to the entrance trail to make the descent back to Oak Creek. Before you leave the top, check out our own special "HAZ" viewpoint that lies just to the north (right) of the entrance trail. Scope the quickest route up to the highest area of rocks within view and you are in for a nice surprise and a fantastic view of the San Francisco Peaks. Not only is this hike a true ascent, but naturally, a true descent as well, so it may be considered somewhat knee challenging. This hike can vary in time depending how long you stay and explore the top, so make sure to carry plenty of water and food. 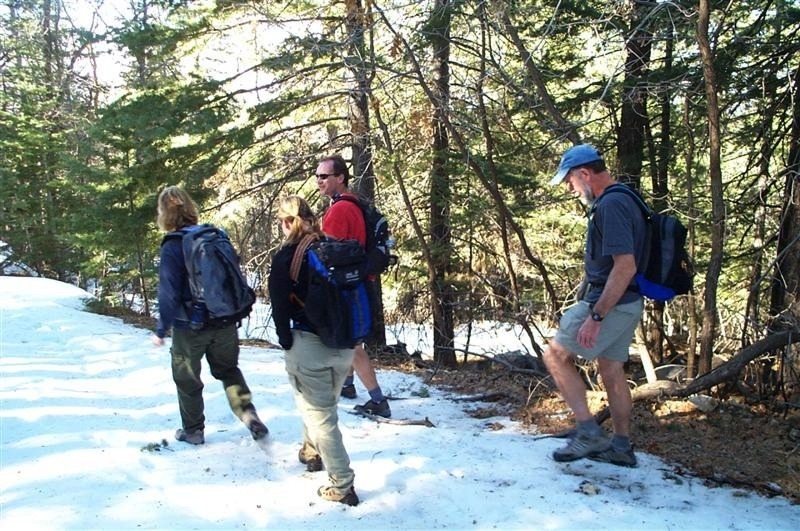 An up to date weather report is a must for this hike, especially if you plan to attempt an off season trip, as temperatures and conditions in this area can vary extremely due to the region and the elevation gains. 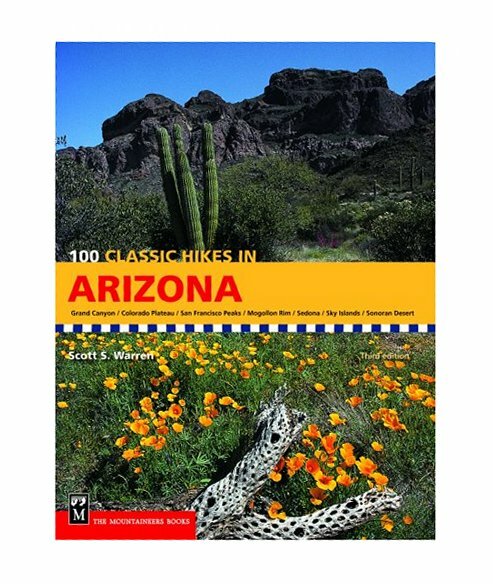 As usual, hike smart and you are sure to have a most beautiful and memorable Arizona experience. 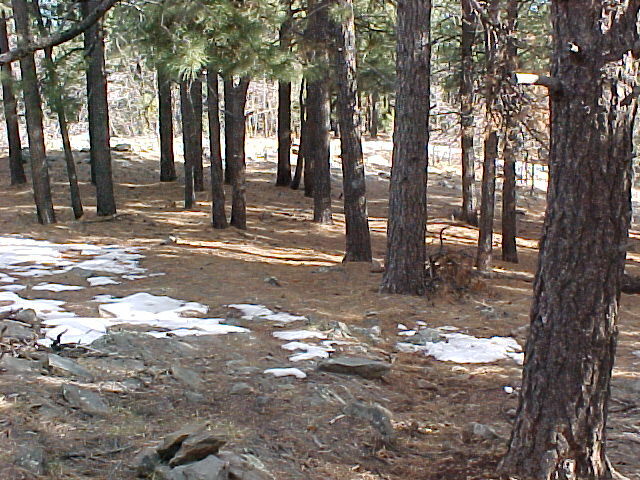 Coconino FS Reports The A.B.Young Trail leaves from the southernmost end of the Bootlegger picnic area. Take steps down to the creek, find a suitable place to "boulder hop" or wade the stream, cross the creek and find an old metal sign indicating the trailhead. It immediately begins a moderately steep ascent and enters wilderness area. The shade of the creek area is quickly lost and nice views of the canyon and some interesting rock formations open up. 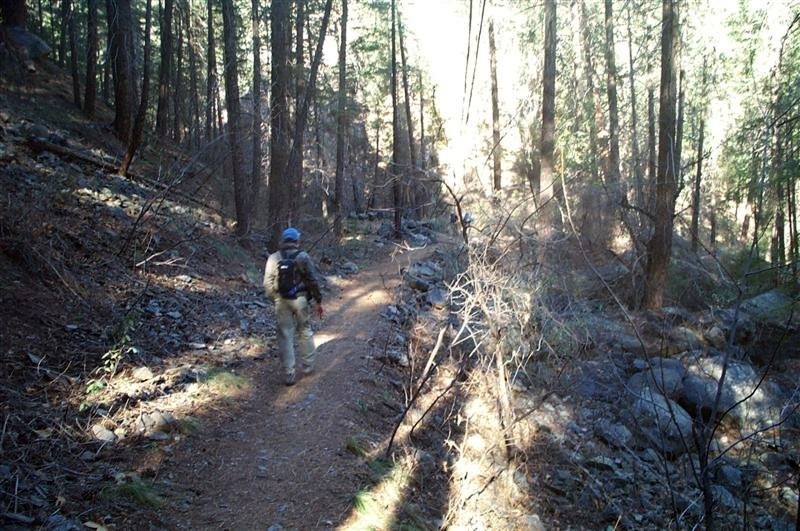 The trail climbs 1600 feet in 1.6 miles over the 33 switchbacks to the rim of Oak Creek Canyon. 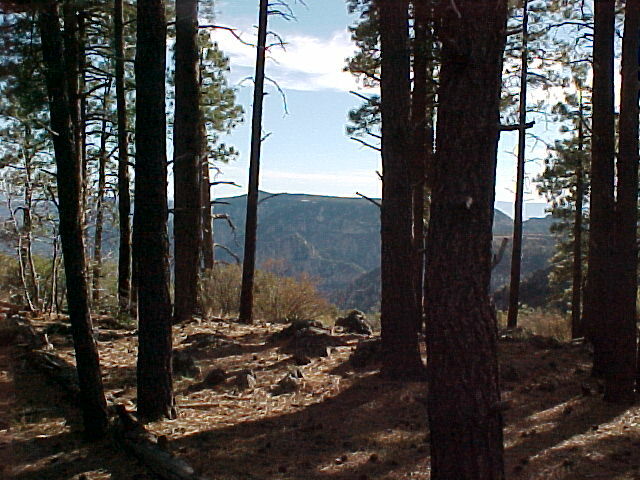 At this point, the trail enters the shade of ponderosa pine and heads west for 0.8 miles on a gradual ascent (this portion of the trail not well marked), ending at the East Pocket Fire Lookout Tower. 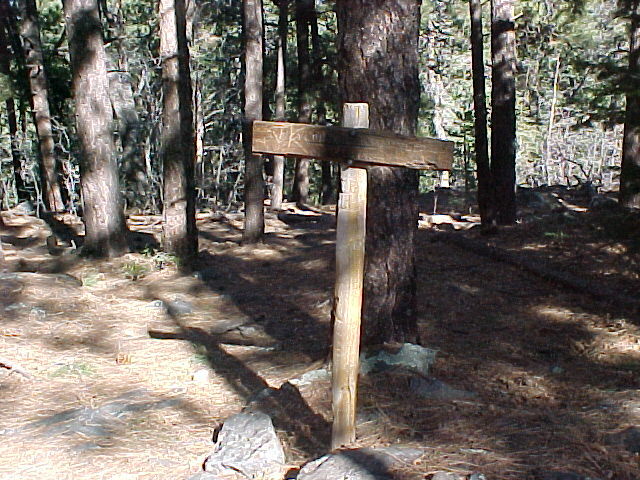 The trail is believed to have been built originally by C.S. (Bear) Howard in the 1880's and it was reconstructed in the 1930's by the Civilian Conservation Corp and supervised by A.B. Young. 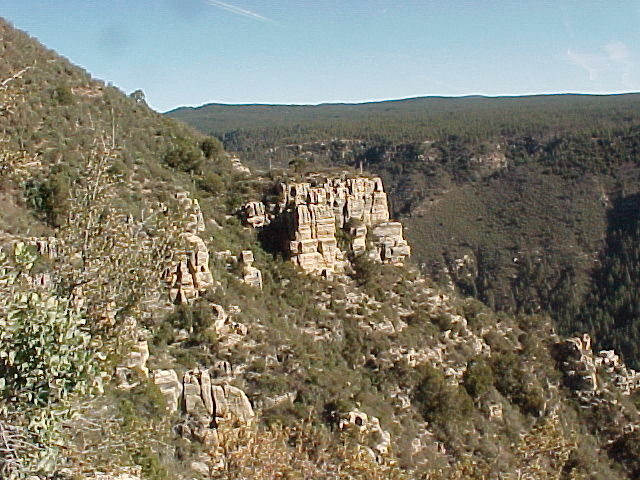 Drive into Oak Creek Canyon to Milepost 383.3. The trail starts across the creek from Bootlegger picnic area. After crossing the creek, a short climb will bring you onto an old road above the creek. The trailhead starts at the old metal sign which is within 300 feet of your crossing. From most crossings, the sign will be just downstream. 2011-04-23 Jim_H writes: While in the past parking for the trail was not to be found in the Bootlegger Campground, the campground has been turned into a day use area (camping no longer allowed) and there are spaces in the facility for trail hikers to use. Road side parking is no longer necessary, unless really, really busy. Red Rock or other Federal pass is required to use these off-highway facilities.